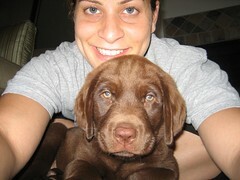 Here is a photo of our new puppy, Roscoe, with Erin. He was one of eight brothers and sisters, all named after characters on the Dukes of Hazard. We had considered changing his name, but it fit him so well.